La initiativa Dlui Dinca Ionel C.M. – a aparut propunerea de a organiza un concurs sistem inchis intre jucatorii din Braila. Concursul va avea loc pe distanta a 9 runde la 4 ore partide,cate 2 ore de fiecare jucator,partidele vor fi notate,si ca noutate nu se admit remizele .Daca totusi la finalul unei partide remiza este evidenta se va mai juca 1 partide blitz la 5 min pentru deciderea pct. Taxa de participare este de 100 lei . Informatii la Dl Dinca Ionel tel 0748911802 si Preda Iulian tel 0742042111. Lista pentru inscrieri este deschisa pana pe data de 4 Decembrie. Va asteptam ! 19-20 Decembrie se anunta un turneu tare cu premii foarte bune in Galati. detalii la Sah Galati ! FESTIVITATEA DE PREMIERE DUPA INCHEIEREA ULTIMEI RUNDE. LOCUL 1 JUNIORI > 15 ANI LOCUL 1 JUNIORI < 15 ANI . articol preluat dupa www.365chess.com Viswanathan Anand was born on December 11, 1969. He is an Indian chess grandmaster and the current World Chess Champion. Anand is one of four players in history to break the 2800 mark on the FIDE rating list. In the April 2007 FIDE Elo rating list, Anand was ranked first in the world for the first time, and he retained the number one spot in the July 2007 list with a rating of 2792, a lead of 23 points. 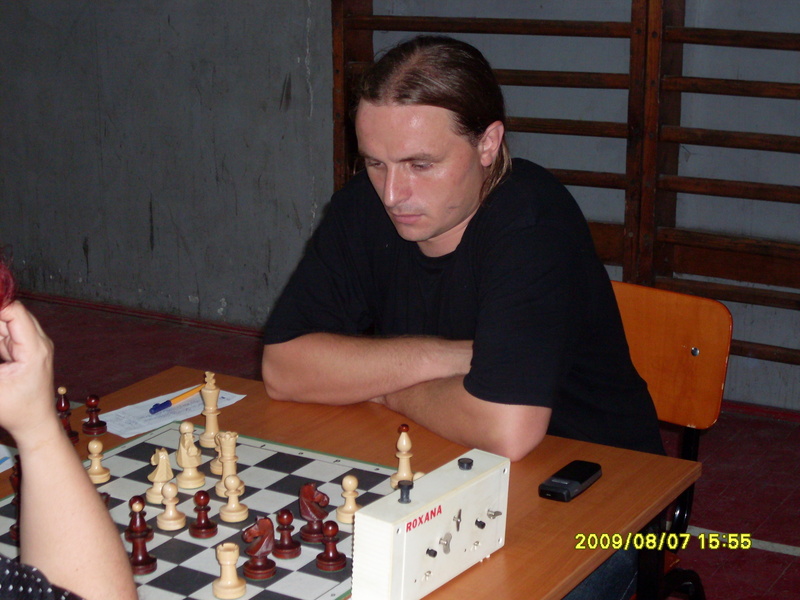 On the current January 2008 list he has an Elo rating of 2799, which makes him number two behind Vladimir Kramnik who has the same rating but played more games in the three months before the list was published. He is the sixth person to head the rating list since its inception in 1970; the other five being Fischer, Karpov, Kasparov, Kramnik and Topalov. Anand became the undisputed World Chess Champion on September 29, 2007, after winning the 2007 World Chess Championship Tournament held in Mexico City. Azi a inceput o noua editie din concursul de sah intitulat „Cupa Reginei” .Sunt inscrisi 11 jucatori ,printre ei se afla Campionul Judetean 2009- Martian Daniel si Vicecampion Judetean Blanaru Ciprian . dupa 6 runde clasamentul provizoriu arata astfel : 1.Batca Ghe I- 5,5 pct 2.Anghel Florin CM- 4,5 pct 3.Lungu Nicolae -I 4pct 4.Martian Daniel -I 3 pct 5.Stroe Antonel -III 3pct 6.Neacsu Alexandru -NC 3pct 7.Blanaru Ciprian -NC 2,5 pct 8.Dinca Ionel -CM 2,5 pct 9.Mergeanu Bogdan -NC 1pct 10.Florea Adrian -NC 1pct 11.Costov Cornel – NC 0 pct .